Bannerghatta National Park is a must see place in the check list of most of people who visits Bangalore or a weekend destination for those who resides here. Living in Bangalore for the last ten years, I have visited this park a number of times, the Big Cat safari, Zoo and the Butterfly park all being some attractions. 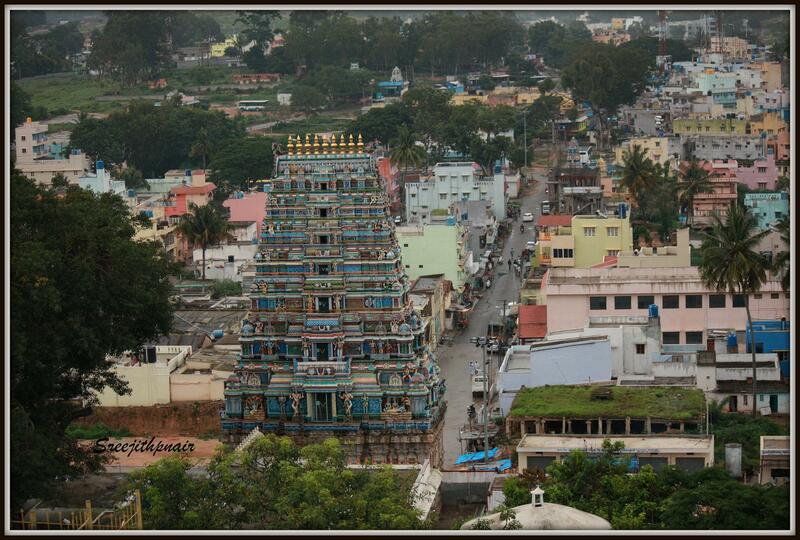 But, there was something I missed for all these years, the Champakadhama swami temple at bannerghatta town. Every time, while taking a left turn at the junction to the park I used to see the temple tower on a small hillock on right side. Thinking of exploring the temple on my way back, I used to proceed straight to the park, but never stopped while coming back. Last week, we planned to visit the park again with my brother and family, but started off pretty late than planned. 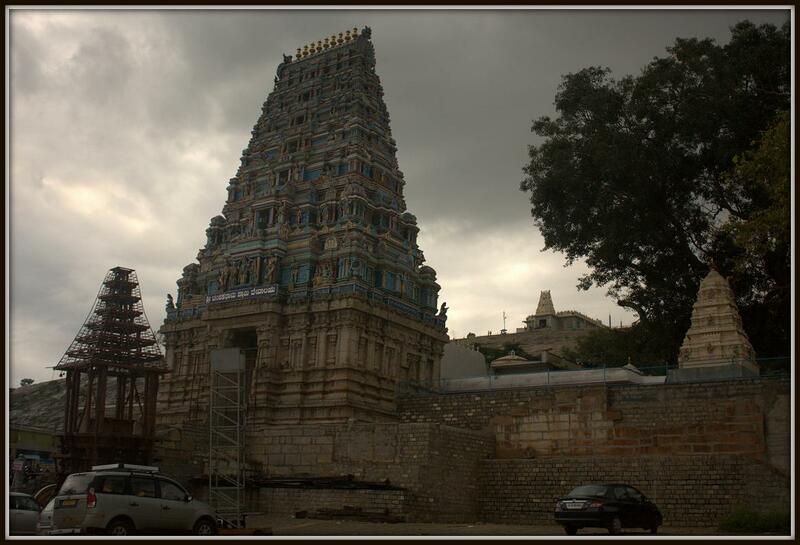 By the time we reached Bannerghatta it was cloudy and light started fading, instead of the left turn I took the right one towards the temple. 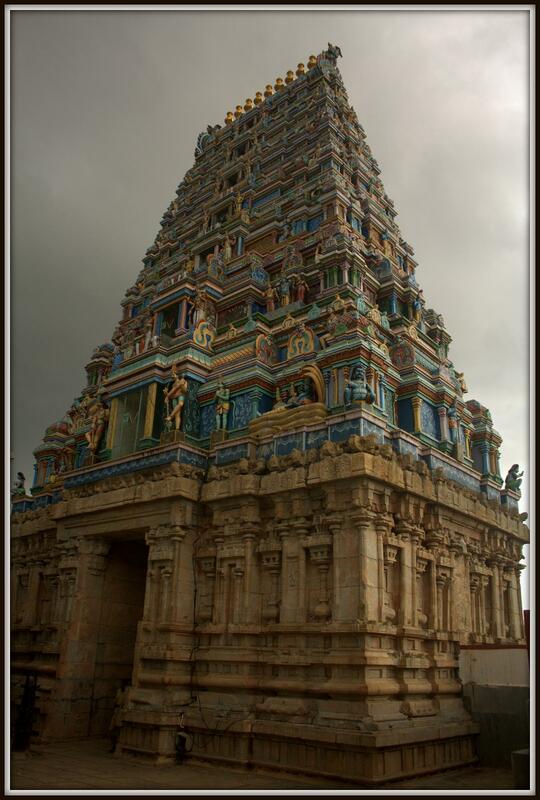 We were greeted with the sight of a magnificent Temple Tower, it’s surpassed our expectations. and there was plenty of action around for our cameras to capture. 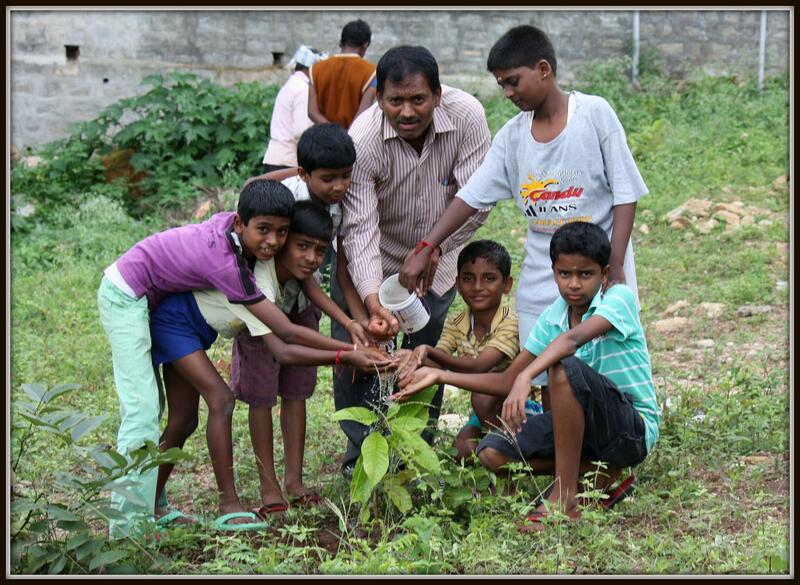 Taking a walk around the temple compound wall I met a few kids, they were planting “Sampige Tree Saplings” . There was one person, Mr. V Anand who was leading the activity. We had a lite chat and I came to know that, the name of the temple came from the Sampige flowers offered to the main deity, one of many forms of lord Vishnu. They were planning to plant 101 saplings around the temple. 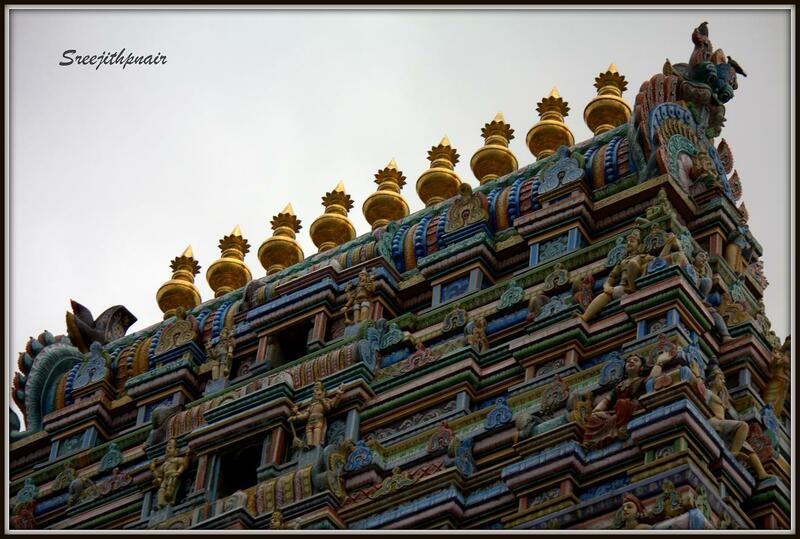 The architecture of the inner sanctum is somewhat different from other temples of same era. After exploring the temple and trying to capture some monkey business, we moved to the Laxmi Narasimha temple behind on a hillock. 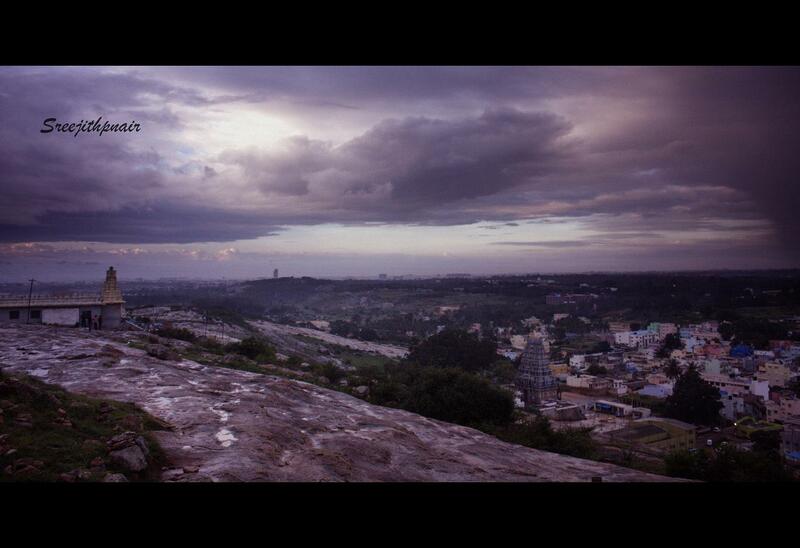 This temple was renovated recently and the best part was the panoramic view we get from the temple premise. It was cloudy in patches and drizzling, sun was setting behind the Ramnagara hills and on one side we could see the high rises of Bangalore. We spent some great time there just savoring the ambiance and felt pretty relaxed. How To Reach: There are frequent buses plying to Bannerghatta town from Kempe Gowda bus terminal, Majestic, Bangalore. You can catch Bus Number 365 or 365J from Platform No.17. 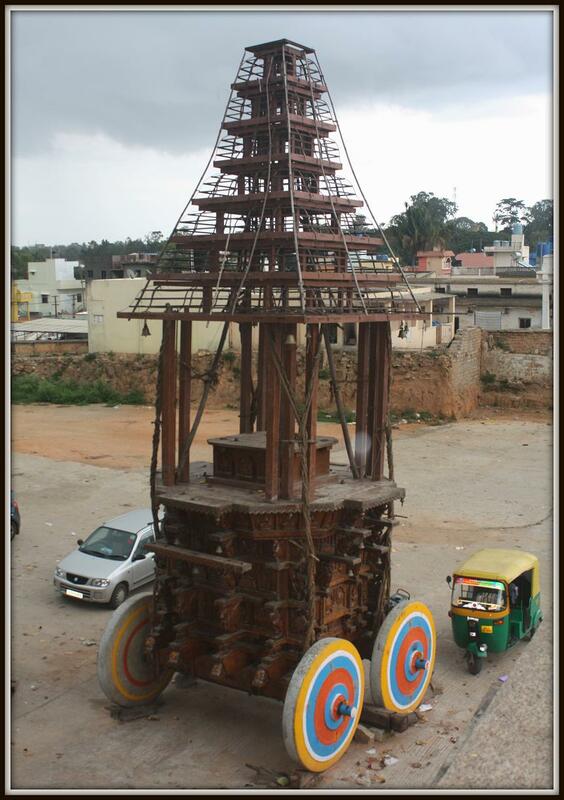 Please find the driving directions from city center to Bannerghatta below, the temple gate could easily be found on the right side, once you reach the town. Such a beautiful place to explore! Great photos! 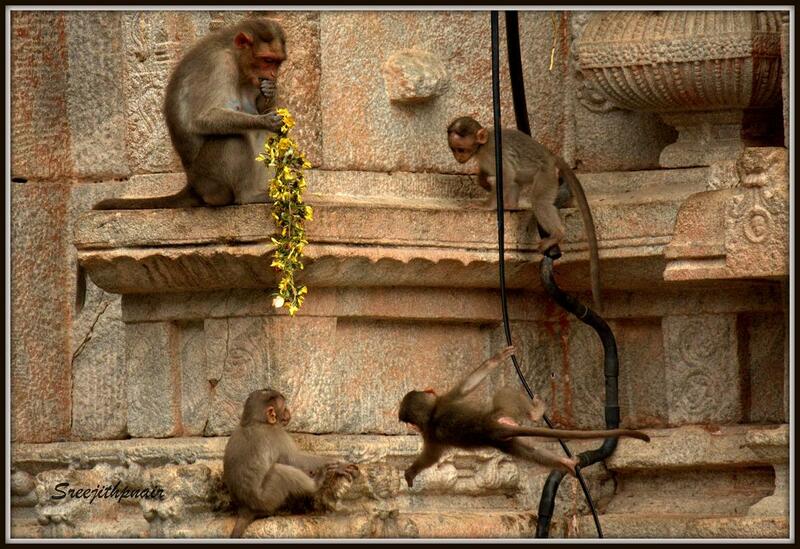 Love the little monkeys playing around everywhere. Thanks for the nice comments Janaline. Great photos! I love India 🙂 Been twice want to go again, and again.. If you haven’t been to Kerala, next time you can plan… it’s one of the most beautiful places on earth, even I’m missing it. Staying away in Bangalore for work. Exceptional entry! I found it very worthwhile. I’ll check back later to see if more posts are added. 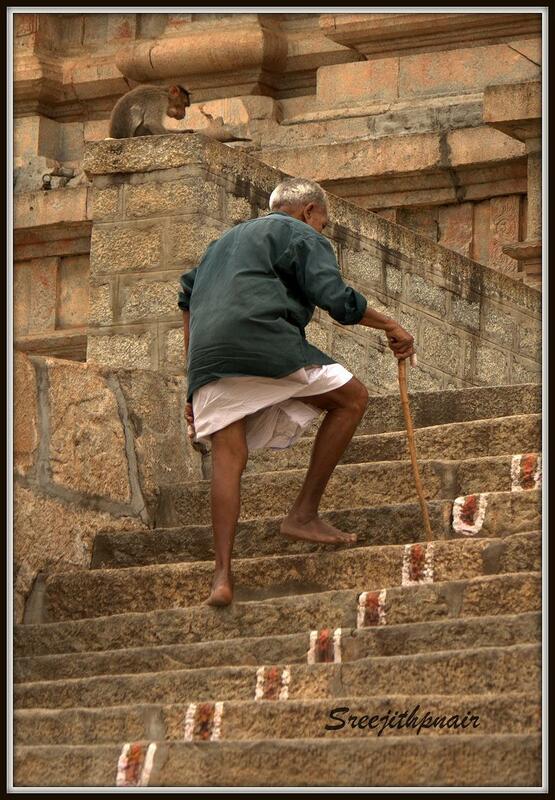 India is soooooo colorful – and this post is enjoyable Sreejith! and the people shots are just fun. 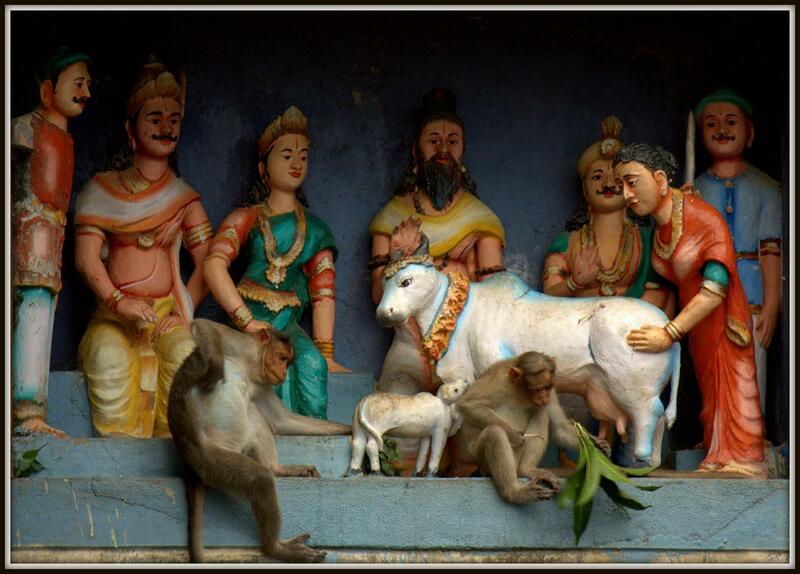 According to Hindu Mythology there are 330 million forms of god. So, there is no wrath of names and forms… it’s always interesting to take a trip to a temple, especially if it were an old temple. They are like treasure troves of art and architecture, and the peaceful ambiance they provide really helps you unwind yourself. 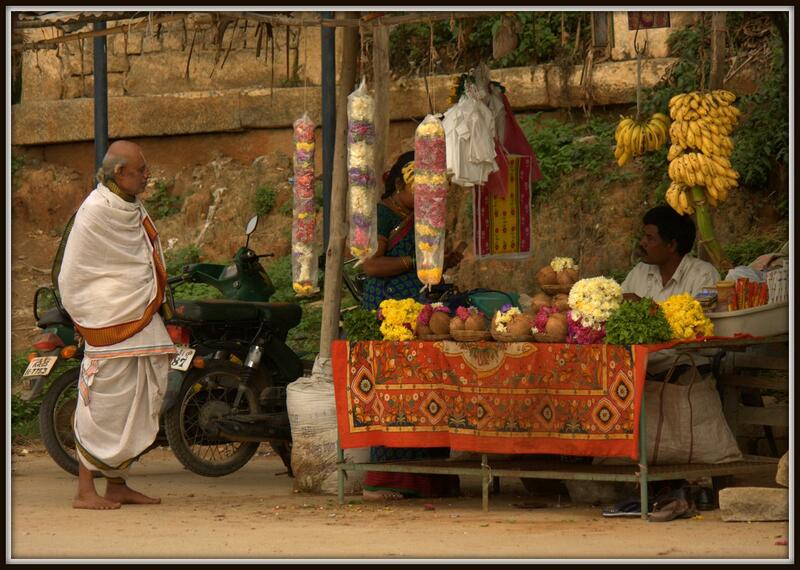 The sampige flower is something always associated with gods and temples, it has great fragrance and looks simple and beautiful. well thank YOU for taking the time to reply – appreciate it my friend – and have a nice weekend S! I am so sorry that, I couldn’t find the contact number of the temple office yet. As soon as I find it, I’ll let you know. This is one beautiful temple complex, right next to a National park and just outside the city limits. 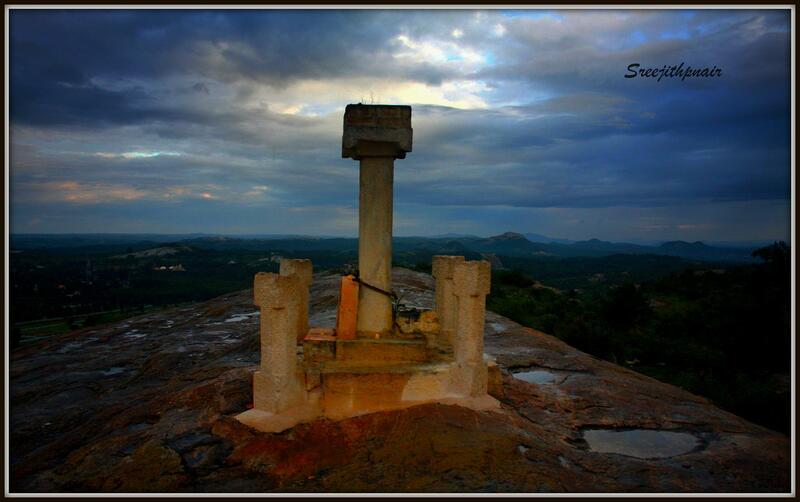 As always, beautiful impression and an interesting narrative, Sreejith! When I started with this blog, I was planning to share my travel stories in and around Bangalore and in my native, Kerala. Were the monkeys pulling up the plants that the kids had just planted? The planting of trees were happening outside the temple complex. Loved this story, Sreejith, about how on this one day you changed your path, and the incredible beauty you found as a result. Fantastic photos of a fascinating place. When I started this blog, I really wanted to share posts rich in content and informative for those who live in Bangalore and would like to explore the beautiful places around it. As I moved back to my native, Kerala and started working with an interesting team to promote sustainable tourism, time became a major constraint. Most of my posts turned photo only posts.